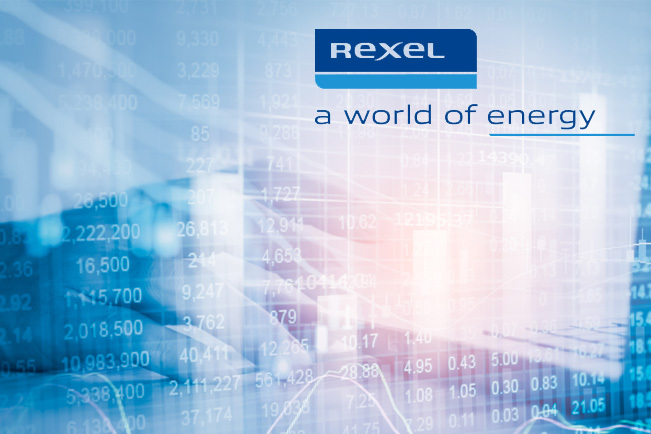 Rexel posted its first quarter 2018 results on Friday, April 26th. “I am pleased that our first-quarter numbers show the benefits of the transformation actions and investments we began implementing 18 months ago. We are demonstrating good growth in our main European countries, in the US and Canada as well as in Asia-Pacific. We continue to invest in our future growth and in the digitization of our business, with digital sales now representing 15.6% of revenues. In the US, the regional multi-banner strategy is now in place and should result in further efficiency gains. “Our EBITA margin at 4% mainly reflects investment in people and digital. Our Free Cash Flow has been strong, and we expect to generate a high level of cash conversion in 2018. Financial statements as of March 31, 2018 were authorized for issue by the Board of Directors on April 26, 2018. They were not audited by statutory auditors. Financial statements as of March 31, 2017 have been restated for changes in accounting policies, following the adoption of IFRS 9 “Financial instruments” and IFRS 15 “Revenue from contracts with customers”; this restatement represented a €0.4 million positive impact on operating income (Q1 2017 operating income stood at €129.8 million as reported on April 28, 2017 and stands at €130.2 million after restatement). The following terms: Reported EBITA, Adjusted EBITA, EBITDA, Recurring net income, Free Cash Flow and Net Debt are defined in the Glossary section of this document. Unless otherwise stated, all comments are on a constant and adjusted basis and, for sales, at same number of working days. In Q1, sales were down 4.2% year-on-year on a reported basis (restated for IFRS 15 impact) and up 3.9% on a constant and same-day basis, reflecting improvement in sales trends in all three geographies. a negative calendar effect of 1.1 percentage points. On a constant and same-day basis, sales were up 3.9%, including an 0.8% positive effect due to the change in copper-based cable prices. In the first quarter, sales in Europe decreased by 0.2% on a reported basis, including a negative currency effect of €26m (mainly due to the depreciation of the British pound, the Swiss Franc and the Swedish Krona against the euro). On a constant and same-day basis, sales were up 2.8%, reflecting growth acceleration across most countries. Sales in Switzerland (6% of the region’s sales) grew by 8.7%, with positive momentum in the project business in an environment that remains competitive. In the first quarter, sales in North America were down 9.7% on a reported basis, including a negative currency effect of €147.6m (mainly due to the depreciation of the US dollar and the Canadian dollar against the euro). On a constant and same-day basis, sales were up 3.5%, driven by Canada and the proximity business in the US. Project business continues to be affected by lower wind and power projects. In Canada (21% of the region’s sales), sales were up 4.8% on a same-day basis, mainly driven by strong industrial sales. We confirm the ongoing recovery in our O&G business (up 9.0%) and mining (up 4.4 %). In the first quarter, sales in Asia-Pacific were down 7.0% on a reported basis, including a negative scope effect of €27.2m following the disposal of our business in South East Asia and a negative currency effect of €24.4m, mainly due to the depreciation of the Australian dollar and Renminbi against the euro. On a constant and same-day basis, sales were up 12.9%. In New Zealand (17% of Pacific), sales were up 1.1%. Middle East and India (18% of Asia) posted a strong performance thanks to a large project in the Middle East (+€7m) and strong automation business in India. At corporate holding level, opex amounted to €6.9m, compared to €2.1 a year ago, mainly because of additional investment in IT & Digital as well as the non-recurring impact of long term incentives. As a result, adjusted EBITA stood at €127.2m, down 4.8% in Q1. an improved adjusted EBITA margin in Asia-Pacific at 1.3% of sales, up 35bps. In Q1, reported EBITA stood at €125.4 million (including a €1.8m negative one-off copper effect), down 13.4% year-on-year. Operating income in the first quarter stood at €113.6 million, vs. €130.2m in 2017. Other income and expenses amounted to a net charge of €7.4 million (vs. a net charge of €9.8 million in Q1 2017). They included €6.8 million of restructuring costs (vs. €7.6 million in 2017). Q1 2017 included a net charge of €6.7 million related to the early redemption of the USD330m (c. €302m) Senior notes issued in April 2013. Restated for those net charges, net financial expenses decreased from €27.0 million in Q1 2017 to €23.8 million in Q1 2018. This largely reflected lower average debt year-on-year and lower average effective interest rate, thanks to the various refinancing operations in 2017. The average effective interest rate on gross debt decreased by 33bps year-on-year in Q1 2018 to 2.9% (vs. 3.2% in Q1 2017). Income tax in the first quarter represented a charge of €28 million (vs. €33.5 million in Q1 2017), a decrease of 16.2%, reflecting a lower tax rate (31.6% vs 34.7% in Q1 2017) following the positive impact of the US tax reform and an 8.2% decrease in profit before tax. Net income in the first quarter is down 3.9% to €60.7 million (vs. €63.1 million in Q1 2017). Recurring net income in the first quarter amounted to €68.2 million, stable compared to Q1 2017 (see appendix 2). An outflow of €226.3 million from change in working capital on a reported basis (vs. an outflow of €329.2 million in Q1 2017). Our improved working capital is mainly due to a favorable base effect with inventory build-up in 2017 in France and in the US, leading to lower payables. At March 31, 2018, net debt stood at €2,183.9 million, down 10.3% year-on-year (vs. €2,433.4 million at March 31, 2017). €24.4 million of positive currency effect during the quarter (vs a positive effect of €3.9 million in Q1 2017). Our first quarter is in line with our expectations and allows us to confirm our financial targets for the full year, as announced in February. a further improvement of the indebtedness ratio (net debt-to-EBITDA2).